Condominiums dominate the residential markets of many major U.S. cities, including the city of Los Angeles. Making a condominium unit into a home through interior transformations can be difficult, but doing so amongst celebrities and industry giants are even more so. Customers demand the latest and most fashionable finishes and furnishings that they see from their neighbor stars and moguls, even if it’s on the tightest of budgets and under the strictest of community rules and guidelines. This is a job for interior remodelers, experts in delivering exquisite homes to owners and tenants alike. The following is a list of the top 15 condominium remodel and interior contractors in Los Angeles; top experts with proven skills and talents to pull off magnificent interior transformations. Principal Joel Portillo founded Encino-headquartered Joel & Co. Construction in 2011 as a general contractor specializing in new construction, custom home building, and commercial and residential renovations, including room additions, kitchen and bathroom remodeling, and sustainable eco-friendly construction. Portillo worked as a foreman for his father and uncle before, having learned about “the unfortunate experiences homeowners were having with builders”, he felt compelled him to establish his company. He and his team are guided by the same principles Portillo lives by: hard work, transparency, an easy-going attitude, and an attention to detail that puts the clients and their visions front and center. Joel & Co. Construction led a bathroom remodelling project in Culver City where the rather uninspired yellow wallpapered space was transformed into a magnificent primarily white ensemble. The entire bathroom was gutted from floor to ceiling and then reconfigured. New cabinets, countertops, shower, tub, and toilet were installed, as well as heating for the floor. The shower area is fully tiled from floor to ceiling in white, accented by a custom grey tile mosaic shaped like an arched window. Lux Builders & Remodeling is a family-owned and operated general contractor and design-build firm based in Manhattan Beach, CA. The firm specializes in residential remodeling and new construction. Founder Sagi Paul established the company in 2005 upon receiving his Contractors License, coming from his role as a project manager to high-tech industry. Since then, Lux Builders & Remodeling has finished hundreds of projects of varying sizes and scopes in the South Bay and Los Angeles areas. The company treats each project as a part of transforming lifestyles, noting their experiences with seeing what their projects do to the owners’ lives. Lux Builders made a complete remodel of a luxury residential unit in Century City. Using modern European designs, the entire space was reconfigured. Aside from a change of layout, the residence received new drywall, a complete kitchen remodel, and complete remodel of three bathrooms, including a master bathroom, as well as new electrical, flooring, and wall paint. 13) Built To Perfection, Inc.
Based in Canoga Park, Built To Perfection, Inc. is general contractor established in 2004. CEO Asher Ben Haim established the company with a core team of design and building professionals who lend creative talents, expertise and experiences to clients to help complete their projects. Fully licensed, insured and bonded, the company offers a complete range of remodeling construction services, from minor room upgrades to plumbing, electrical, flooring and masonry. Built To Perfection is proud of its thoroughness in every stage of the remodeling process. In a residence in Los Angeles, Built To Perfection recently completed a kitchen remodel. The kitchen was gutted and reconfigured to maximize the limited and closed space. White cabinetry and counters wraps around the new stainless steel appliances. Creating contrast in the room are dark grey backsplash and light-colored hardwood flooring. American Builder Construction Company is a Van Nuys, CA-based general contractor that provides a full range of residential and commercial remodeling services within the Los Angeles area. Services included bathroom and kitchen remodeling, room additions, and paint and stucco application. Formed in 2005, American Builder Construction has been steadfast in striving to provide the best and most client-sensitive service the industry has to offer, believing that delivering a well-done job gives convenience to the homeowner in the long run..
American Builder Construction built a kitchen in a small luxury unit in Los Angeles. The limited space became an opportunity to implement an open concept, uniting the kitchen and the dining area, with only the sink counter gives any sense of separation. New granite countertops and golden brown cabinets were installed, as well as new plumbing, appliances, and a colored tile mosaic backsplash. A wine chiller was also installed in the kitchen, its door facing the dining area for easy access. Hi-Tech Builders, Inc. is an Encino-based general contractor that offers multiple construction services, including interior renovation, home remodeling, and new construction. Hi-Tech is qualified for any construction job, from simple room upgrades to the construction of an entire house including landscaping. The firm was established by President David Lahyani in 1990 to serve as a one-stop shop for general contracting needs. Hi-Tech Builders recently completed a kitchen remodel in a residence in Los Angeles. The home’s small space led to the decision to integrate the laundry into the bathroom. The result is that two washing machines were installed under the counter adjacent to the shower. In addition to the laundry area, the bathroom also received a total makeover. Construction Masters is an Encino-based full-service general contractor established more than 25 years ago by CEO Moshe Cohen. The firm offers a full range of general construction services, including kitchen and bathroom remodeling, room additions, roofing, painting, flooring, and windows. The company is reputed as a general contractor who delivers top-notch work that gives satisfaction to owners at affordable prices. Construction Masters recently completed a bathroom remodel in a residence in Los Angeles. The off-white marble wall tiles behind the toilet and in the shower were installed at different heights to create a textured look. A washing machine is tucked under the wooden counter and just near bathroom sink. Flat marble tiles cover the wall beyond the toilet and shower, as well as the floor. Amerbuild, a family owned and operated construction and remodeling company, has been based in Woodland Hills, CA since 1992. The company is a fully licensed, bonded and insured contractor that proudly serves residents throughout Los Angeles and Southern California. The firm specializes in both interior and exterior remodeling for both residential and commercial sectors. The firm is an Accredited Business by the Better Business Bureau with an A+ rating, highlighting Amerbuild’s determination for 100% customer satisfaction. Amerbuild recently finished a kitchen remodel in a residential unit in Los Angeles, for a homeowner who wanted to combine traditional aesthetics with modern amenities. The result is a kitchen with Colonial-designed cabinets and counters, hardwood countertops, white tile backsplash, and modern appliances including an electric stove and modern stainless steel smokestack with glass rim. Reliance Design Build Remodel is a general contractor and design-build company based in Los Angeles. Co-owners and project managers Bahrang and Behrooz Motamedi formed the company in 2006, and are joined by co-owner and interior designer Golnaz Motamedi in leading the company. The firm offers interior design, architecture, permit expediting, kitchen, bath and interior remodel, and room addition services throughout the Los Angeles area. The company firmly believes in a fun and stress-free remodeling process. Reliance is an active member of the National Association of the Remodeling Industry, National Kitchen and Bath Association, and the National Association of Home Builders. Reliance completed a complete condo remodel for a 1980’s high-rise complex in Los Angeles. To give the unit a modern design, a nearly achromatic color scheme was used. A particular highlight of the remodel was the new set of cabinet and countertop surfaces; the surfaces were polished to the finest sheen to refract as much light as possible, further highlighting the color scheme and modern look. Advanced Builders and Contractors is a general contractor and design-build firm based in Tarzana, CA. The company specializes in a whole range of construction projects, from basic home improvements to additions, major remodels and new construction. The firm offers these services extensively in Malibu and in the greater Los Angeles area. Local publications Malibu Times and VoyageLA, as well as national outlets such as NBC and Elle Decor featured Advanced Builders and Contractors and its work. Advanced Builders and Contractors recently finished a complete remodel of a luxury residence in Los Angeles. The kitchen, dining and living room were given an open plan. A glass wall separates the open living room from the patio, which can be manually retracted to open the indoor space to the outdoors. Hardwood flooring flows from the inside out, making the interior and exterior spaces one entire open space. Modaa Construction is a general contractor headquartered in Santa Monica with an office in Studio City, CA. The firm specializes in both residential and commercial construction, particularly in residential remodeling and additions, custom home construction, and commercial tenant improvements. Each project is led by a LEED AP Project Manager to ensure the firm’s commitment to sustainability in construction. Despite being young in the industry, with only a decade of experience, Modaa’s skill, diligence and dedication to each project earned them the notice of publications such as The Architect’s Newspaper, the Los Angeles Times, the Observer, and Los Angeles Magazine, all of whom featured Modaa’s work. Modaa recently finished a remodel of a residential loft in the Arts District of Los Angeles. The entire unit was gutted and given new layout, furnishings and finishes. Project highlights include the birchwood flooring throughout the unit, a brand new modern kitchen with bar, the simple yet modernly designed bathroom, open ceiling concept, and modern bedroom. Greenworks Construction & Design is a Los Angeles-based, family owned and operated general contractor and design-build firm established in 2009. The firm specializes in kitchen, bathroom, and interior and exterior remodeling, as well as room additions and new construction throughout southern California. The firm is a reputed contractor with a portfolio characterized byhigh-quality craftsmanship, budget-conscious execution, and sustainable construction. Greenworks Construction & Design’s excellence in design and construction has led to it being featured in the media, including on HGTV’s House Hunters Renovation, People.com, and Bravo’s Million Dollar Listing L.A. Featured in a 13th season episode of HGTV’s House Hunters Renovation is the complete interior renovation of a residence in Los Angeles that was bought for $1-3 million. The new homeowners, a newly-wed California couple, hired Greenworks to renovate the entire residence. The build was challenging, particularly with a faulty electrical system that threatened to cause a fire. The result, however was a wonderful living space, with a particular note given to the brand new kitchen. Kavin Construction, Inc. is a Los Angeles-based general contractor established in 1975 by company founder Michael Kavin. Kavin started in his construction career as a college student and a summer part-time carpenter for a lumber company in Los Angeles before venturing out on his own. His skills and experience not only earned him a contractor’s license in 1978, but also a successful stint as an expert witness in construction dispute cases in California shortly thereafter. 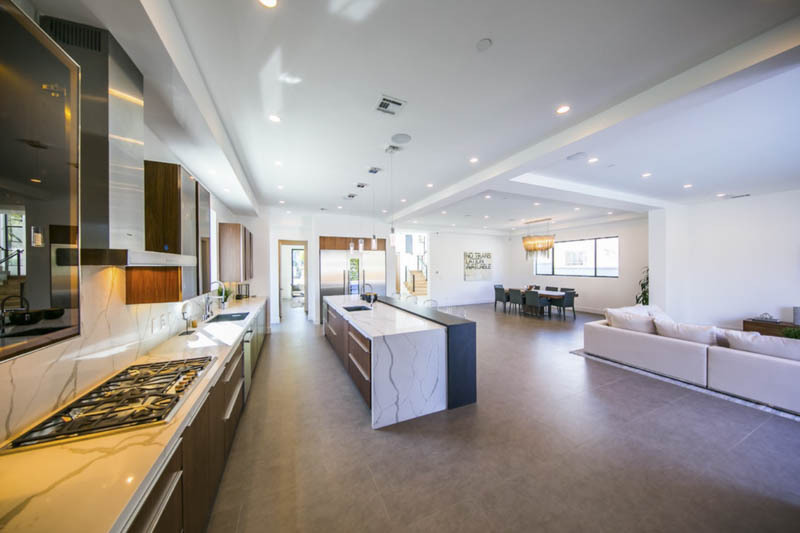 The Architectural Digest and The Telegraph have featured Kavin Construction and its work, while it has also been recognized as the #1 Home Builder in the Top 10 Beverly Hills Awards. Kavin Construction completed a kitchen remodel in a residential unit in Los Angeles that demanded a modern and quite minimalist design. Black cabinets and counters were paired with white countertops and island to create contrast. The cooking range is tucked into the island and is topped of by a stainless steel exhaust. The overhang cabinets have glass doors and lit top tiers, perfect for displaying important and priceless artefacts. Addition Building and Design is a general contractor and design-build firm established in 1896 by CEO Mike Ross. The company offers one-stop shop services to new construction and remodeling projects including 3D architectural/structural renderings, interior design, landscape architecture, and plans and permits expediting. The firm is also an environmentally-conscious company, offering installations of water purification systems, garage electric car chargers, and solar panel lines free of charge. Additional Building and Design has earned a regular spot on Qualified Remodeling Magazine‘s Top 500 Companies. In Santa Monica, Additional Building and Design finished a complete remodel of a condominium unit. The entire unit was gutted to make way for new hardwood flooring, elegant finishes and furnishings, and more lighting fixtures. The kitchen joins the living and dining areas in an open concept living space by converting the wall between the dining area and kitchen into a bar. In the kitchen, new cabinets and shelves maximize the limited storage space. Established in 2008, Martins Construction Corporation is a Los Angeles-based general contractor specializing in residential and small commercial new construction, addition and remodel. President Robert Martins founded and leads the firm with a strong belief in open and effective communication in the construction process. Martins’’s exceptional craftsmanship, assured use of advanced materials and technologies, and philosophy of socially responsible building practices earned the company a number of awards and accolades, including the National Fine Builders Association Award, the Master Design Award, and a spot in Qualified Remodeler Magazine Top 500 list. In a condo unit in Los Angeles, Martins Construction led an extensive bathroom remodel. Black tiles were used for the new flooring, and long tiles of differing shades of grey were used to cover some parts of the walls, especially in the tub and shower area, while the rest of the wall were painted white. The black countertops provided a perfect compliment to the white cabinets and sink. Treeium is a full-service general contractor serving Southern California, specializing in a wide range of home improvement projects, including interior remodel and home energy performance upgrades. The firm is headquartered in Valley Village, and has four additional offices in Irvine, Pleasant Hill, Riverside, and San Diego. Argentina-born CEO Moty Ginsburg co-founded the company in 1991, and leads a residential general contracting firm that is well known for its innovative eco-friendly work. The firm is a proud member of NARI and is a certified BUILD it GREEN Professional. Treeium is also recognized as top company in a number of rankings, including Inc Magazine’s Inc 500, Qualified Remodeler’s Top 500, and the Remodeling 550. Treeium recently completed a complete interior remodel of a residential unit in Los Angeles. The simple white wall paint is contrasted with brown tile flooring, which covers the entire common living space. White marble with gorgeous dark grey streaks was used for countertops and backsplash, giving the counters a elegant built-in look. Brown wooden counter and overhang cabinets gives further contrast to the kitchen. The project also includes remodels of the bathrooms and bedrooms.